Universal health, education, and other public services reduce the gap between rich and poor, and between women and men. Fairer taxation of the wealthiest can help pay for them. Our economy is broken, with hundreds of millions of people living in extreme poverty while huge rewards go to those at the very top. The number of billionaires has doubled since the financial crisis and their fortunes grow by $2.5bn a day, yet the super-rich and corporations are paying lower rates of tax than they have in decades. Click here to read more. TO VIEW OXFAM SOUTH AFRICA LAUNCH PHOTOS CLICK HERE CLICK HERE. Oxfam South Africa welcomes the Pretoria High Court ruling against the Department of Minerals and Energy, and the Australian company, Transworld Energy and Mineral Resources (TEMR) over the right to mine in Xolobeni in the Wild Coast of the Eastern Cape. The court ordered the minister of mineral resources to obtain full and formal consent from the Xolobeni community prior to granting any mining rights on their land. This after the Amadiba Crisis Committee launched a court action to protect their environment following the request by TEMR’s application for rights to mine the titanium-rich sands at the Umgungundlovu area of Xolobeni. An independent commission will be set up with immediate power to carry out a wide-ranging review of Oxfam’s practices and culture, including its handling of past cases of sexual misconduct. It comes as Oxfam announces a comprehensive plan of action to strengthen safeguarding systems across the organization and stamp out abuse. Oxfam South Africa believes in the collective power of people and invites you to become a supporter. By becoming an Oxfam Supporter you join a global movement by standing up against poverty and injustice. 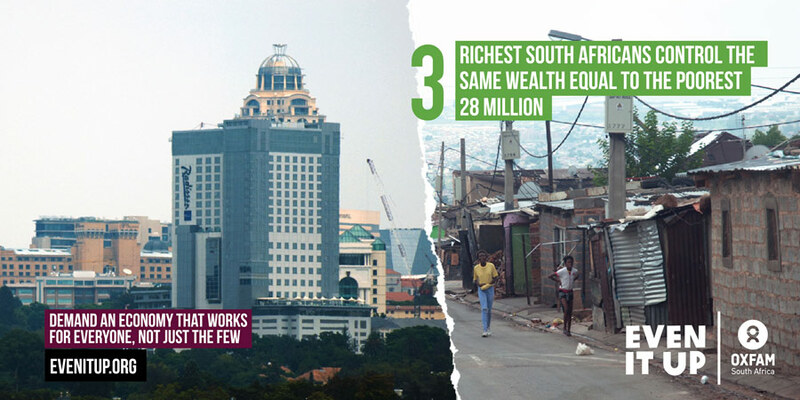 Sign up as a supporter of Oxfam South Africa in our quest for a world without poverty. #Oxfam at BAPA+40,20-22 March 2019 BAPA+40 opens today, the 2nd High-Level Meeting (HLM) of South-South Cooperation held in Buenos Aires. This is the second HLM on South-South Cooperation (SSC) since the first HLM was held 40 years ago. OZA stands in solidarity with the Southern CSO Alliance for SSC, calling for the strengthening of people to people engagement in SSC. At BAPA+40, OZA launched the Civil BRICS documentary (Watch Full video) as a demonstration of effective people to people engagement in South-South cooperation. Inequality is out of control. The wealth of the richest 1% is more than the rest of the world combined. Experts: South Africa’s Poor Will Revolt, If They Feel They Have No Choice I society. A social uprising could be on the cards if South Africa’s leaders do not take drastic action to alleviate poverty, experts have said.